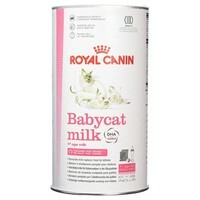 Royal Canin Feline Baby Cat Milk: 1st age kitten, from birth to 2 months. For large litters, insufficient milk production by the mother, or separation of the kitten from her mother it is essential to provide a milk substitute with properties as close as possible to the female cat's maternal milk. The milk substitute must be adapted to the digestive abilities of the young kitten, which cannot tolerate excess lactose (milk sugar). This is why cows' milk is unsuitable. It must also have a high energy content to promote fast and regular weight gain (10 g/day). It is a good idea to weigh the kitten every day to check on her growth.